In Hadoop Ecosystem uses an HDFS for stores a large amount of data that stored file system is running on Hadoop cluster machines. HDFS stores the three types of data like Structured, Semi-Structured and unstructured. Hadoop cluster adding nodes to the cluster. If adding more nodes the cluster is having a large number of datasets. 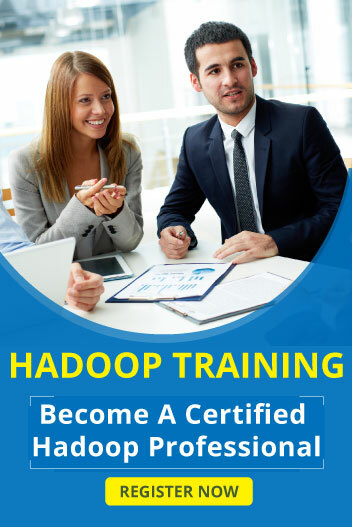 In Hadoop Ecosystem uses a MapReduce for Processing a large amount of data set in the form of key /value pair. MapReduce is the one type of Programming that program applied to Structured, Semi-Structured and unstructured data in Hadoop. Uses of Key/Value pair is mapping the element and it acts as an identifier. Sqoop is one type of tools and used to transfer a large amount of data between Hadoop from RDBMS to HDFS. Main purposes of flume are collecting the data and moving huge amount of data. Main Purposes of Hive is querying and analyze the data from HDFS. Hive deals unstructured data with query language and it is similar to SQL. It runs on MapReduce and processing backend data in HDFS. Scripting Language of Pig is Pig Latin. Pig Performs Data Manipulations and it is similar to SQL. Pig converts all the tasks at Map and Reduce tasks and that tasks are run in Hadoop. It deals structured data only using pig latin. HBase is a NoSQL database and it runs on top of the HDFS. Main Purpose of HBase is read and write a large number of datasets. HBase stores the data in rows and columns. Hbase programming written in only Java. HBase does not support Structured Query Language. Mahout is an open source machine learning and it is written in Java Program. It mainly used to implement the java web application program. It also manages the Hadoop jobs. It has three types of a job such as Workflow jobs, Coordinators jobs, and Bundle jobs. Ambari Maintained by the administrator of the system and it is an open source framework. It is also called as an administrative interface. It has GUI tool for handling pig and hive query and also used to browsing files and Oozieworkflows. Main services of ZooKeeper is configuration and synchronization used by the distributed application.